Republican presidential candidate reiterates his support for Israel after being asked about wasting American money on "Zionist Israel". 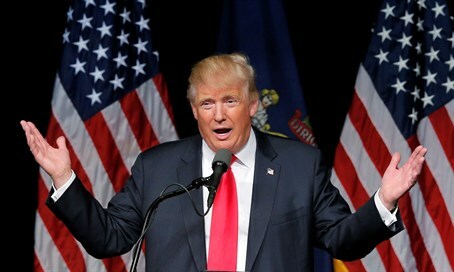 Republican presidential candidate Donald Trump on Thursday reiterated his support for Israel and said that, as President, he would “protect Israel 100 percent”. Trump's comments, quoted by The Washington Free Beacon, came in response to a question by an anti-Israel man who attended his New Hampshire rally. The man took the microphone during the question-and-answer section of the event and told Trump he had two points to make. Trump has continuously expressed his support for Israel and has promised to increase American military aid to the Jewish state. A senior aide to Trump recently told Israel's Channel 2 News that Israel need not rush to negotiate a new Memorandum of Understanding with the current administration because a Trump White House would significantly increase aid to Israel. “Our view is that the aid package to Israel will certainly not go down, and in all likelihood it will go up in a material amount, because Israel must maintain a technological and military superiority in the region,” he said. The advisor also hinted that Israel would find the terms of negotiation with a Trump presidency far more favorable than with the current administration.